Last week and naturally the weekend offered a lot of top football including surprises, rainy weather and of course boots in abundance. We kept our eyes on the pitch and can now bring you your boot fix  come along a check out our boot spots from the weekend. 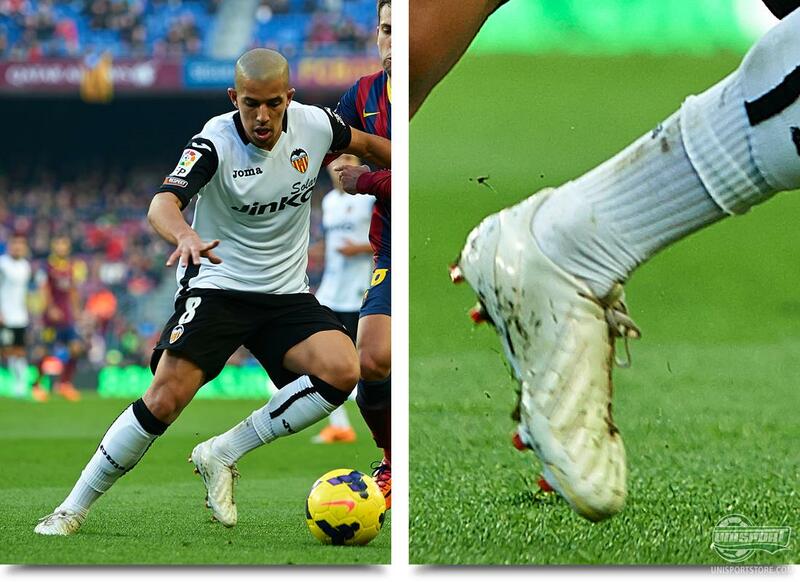 Sofiane Feghouli (Valencia)  Adidas F50 Adizero Whiteout Valencia delivered a surprise as they beat FC Barcelona on Camp Nou during the weekend, which is quite the achievement. Our eyes where also caught by Feghouli, who had taken the white Valencia style a step further and was wearing a pair of whiteout Adizeros. We are big fans of the plain coloured boots, and Feghoulis choice is certainly popular here at the Unisport HQ's. Chico Flores (Swansea)  Nike Mercurial Vapor IX ID Chico Flores was in the centre of a rather controversial situation, as Andy Carroll got sent off for striking Spaniard's face. If we forget about Flores' rather theatrical reaction (pun may be intended), the Swansea defender was wearing not just one, but two Nike-ID football boots; where the right is black with a volt swoosh, and the left is black with a grey swoosh. What do you think? 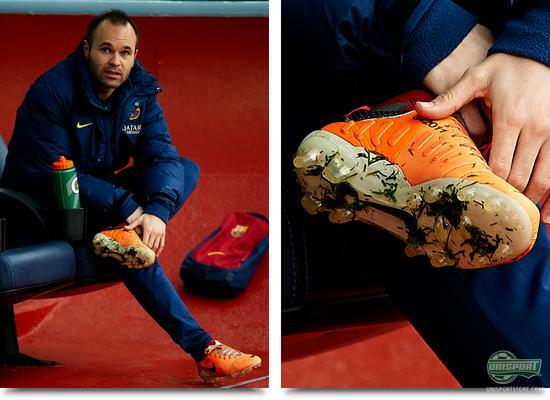 Andres Iniesta (FC Barcelona)  Nike CTR360 Maestri III Atomic Orange/Black/Total Orange Andres Iniesta seems to be tailored for the Nike's control boot, the CTR360 Maestri, but in fact the Spaniard actually prefers a different stud configuration, instead of the one normally found on the CTR360 Maestri III. Iniesta uses the stud configuration from the Tiempo Legend IV, which Nike has disguised as a Maestri stud configuration. It consists of rounded studs under the forefoot and bladed studs around the heel. 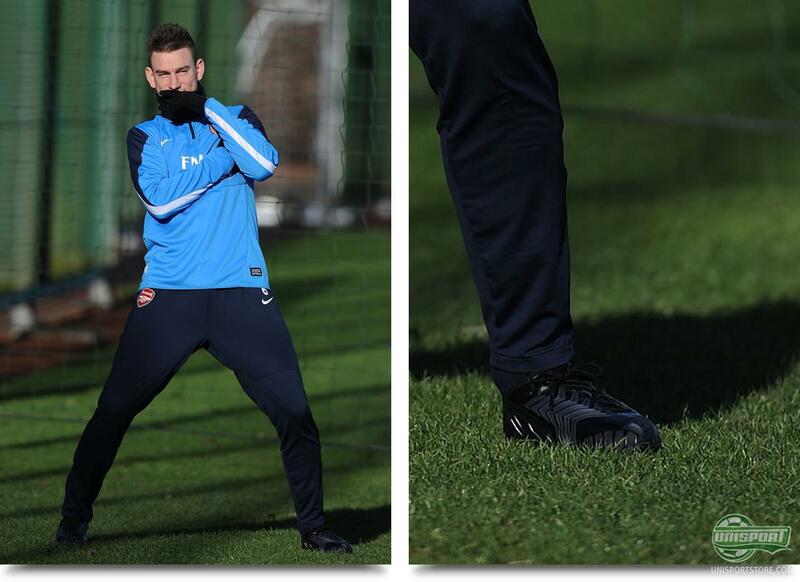 Laurent Koscielny (Arsenal)  Adidas Predator prototype Okay, it's not from the weekend game, but Koscielny was, just as his defence colleague Per Mertesacker, wearing a blackout Adidas prototype  and with, what looks like strike improving elements on the instep, the Frenchman's boots certainly look interesting. 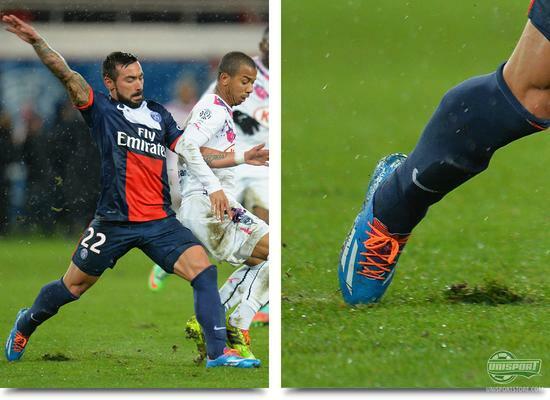 Ezequiel Lavezzi (Paris Saint Germain)  Adidas F50 Adizero Lavezzi wears Adidas and a speedy kind  so why is it interesting that he is wearing Adizero's you may ask? Well, the little Argentinian was among the top names as Adidas, last year, launched the Nitrocharge, and therefore we had to look a second time as Lavezzi, this weekend, took to the pitch in his new blue Adizeros. 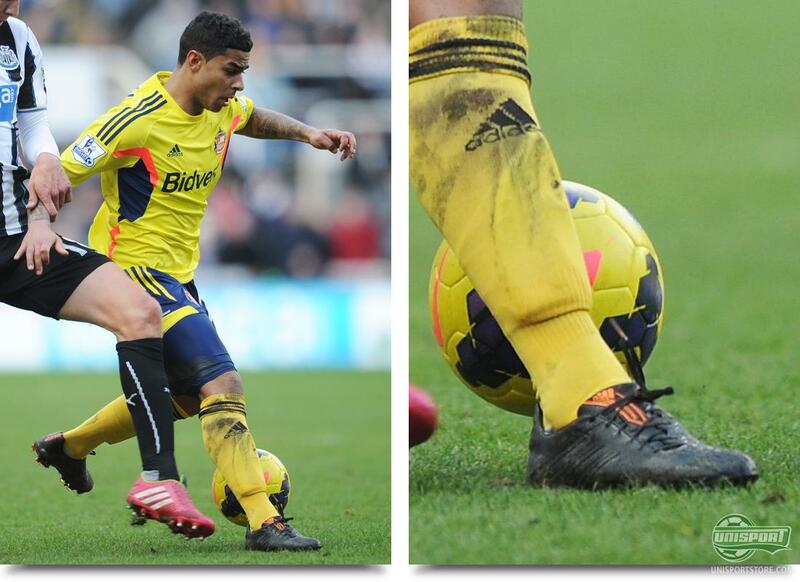 Liam Bridcutt (Sunderland)  Adidas Predator LZ II Blackout The weekend also offered the Tyne and Wear derby between Sunderland and Newcastle, and here the Wearside did the business and gave the Sunderland fans a top weekend. Liam Bridcutt from The Black Cats was wearing his blacked-out Predator LZ II, which are rarely seen  and which look super cool on the pitch, we will have to add. 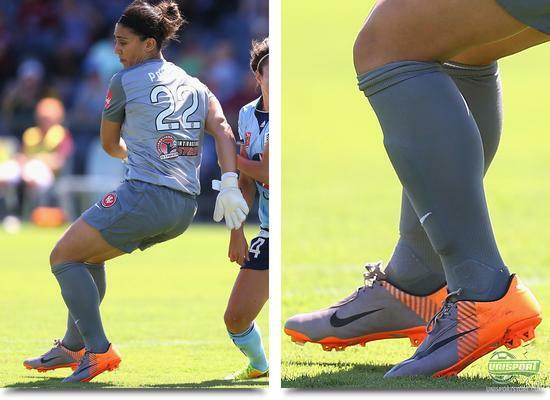 Dimitra Poulos (Sydney Wanderers)  Nike Mercurial Vapor VI Silver/Orange We always get a little sentimental when old football boots like this one pop up  and the Vapor VI in Silver/Orange takes us back to the World Cup in 2010 where Nike, with their Elite Pack, launched all of their top models with this design. Naturally it was 'older brother' Mercurial Superfly II Elite who took most of the attention, but one should certainly not forget about the Vapor VI. Poulos definitely hasn't, and the colour match with the goalkeeper kit is just spot on! Robin van Persie (Manchester United)  Adidas F50 Adizero custom Orange/Black Another bad weekend for United fans, where they went to Stoke-on-Trent and had to settle for a 2-1 defeat thanks to two goals by Charlie Adam. 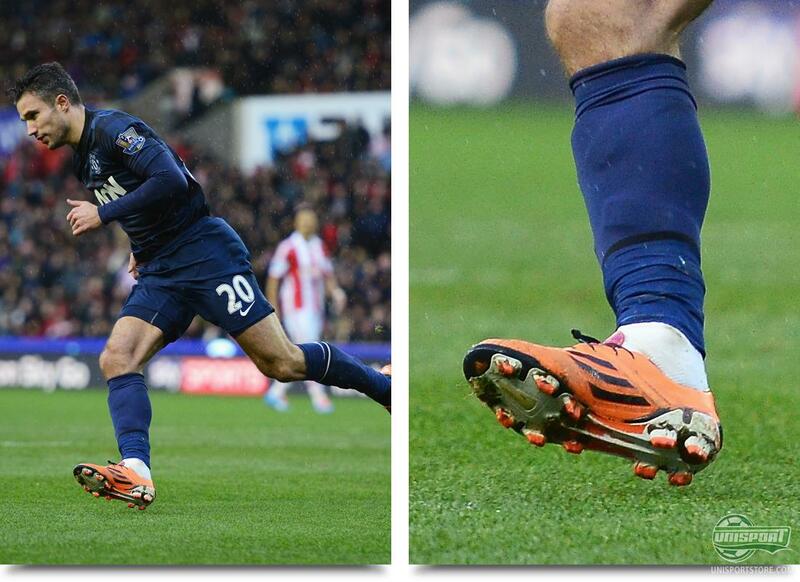 Robin van Persie got the one goal for United in his specially designed football boots, which are made to look like an Adizero, but have a leather upper and the sole from an adiPOWER Predator. One may say that this makes it an Adidas zeroPOWER? Or an Predizero? 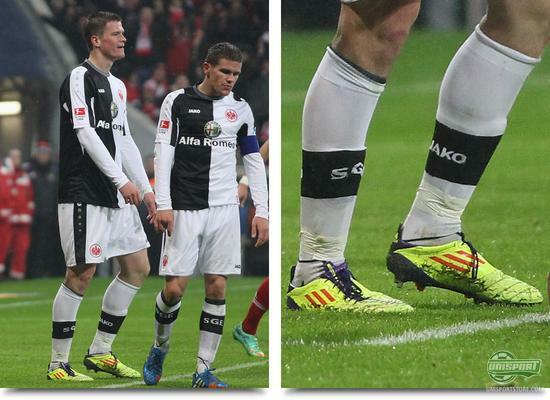 Alexander Madlung (Eintracht Frankfurt)  Adidas F50 Adizero Neon/Red/Navy As previously mentioned, we always enjoy when old boots pop up in action, and therefore we must also applaud Alexander Madlung for his choice of the second generation of Adizero in Neon and Red  and also for his name, which we find very cool. Leonardo Ulloa (Brighton)  Nike Tiempo Legend V Reflective We are not alone in loving the White/Black Tiempo Legend V from Nike's Flash Pack  and the boot has quickly founds its way out and about with the pro's. 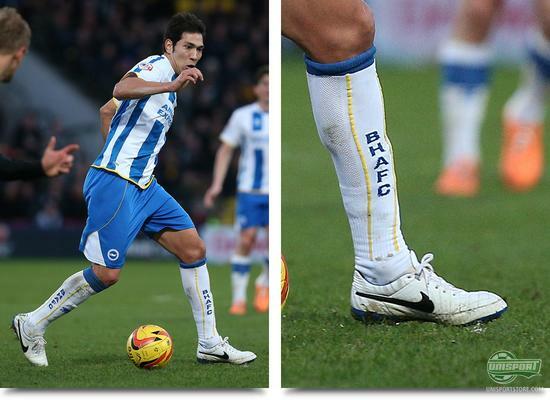 One of them is Leonardo Ulloa from Brighton Hove & Albion, who has managed to match the White/Black/Blue boot very well with his club kit. Hats off! Victor Valdes (FC Barcelona)  Adidas F50 Adizero Orange/Black In connection with his switch from Brazilian Penalty to British Sells, Victor Valdes has also been wandering a bit about in terms of football boots. But now it seems that Adidas have sealed a deal with the goalkeeper, who in the weekends defeat to Valencia, was wearing a pair of Adidas F50 Adizero. 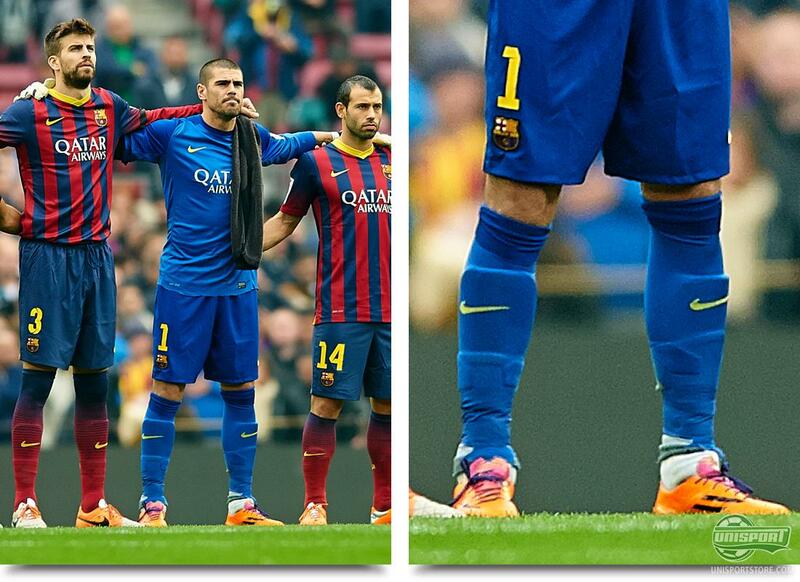 Not long ago, Valdes was wearing the Predator LZ II Berry/Running White, so what the keeper is going to pick, only time will tell. We have seen a lot of good football and nice football boots over the weekend. There also were a couple of spots that we couldn't fit in this time round  so, if you have spotted something cool over the weekend that we missed, feel free to share it with us on Facebook and Twitter.